YPSA organized National Workshop on “Sharing the Workplace Intervention in Garments Industries with the GOB & Local Govt. Bodies” was at Silver Spoon, Agrabad, Chittagong held on January 28. Mr. Farid Uddin Ahmed Chowdhury District Commissioner of Chittagong was present as the Chief Guest in the program. Prof. Dr. A Q M Serajul Islam – Advisor, YPSA consortium & Ex. 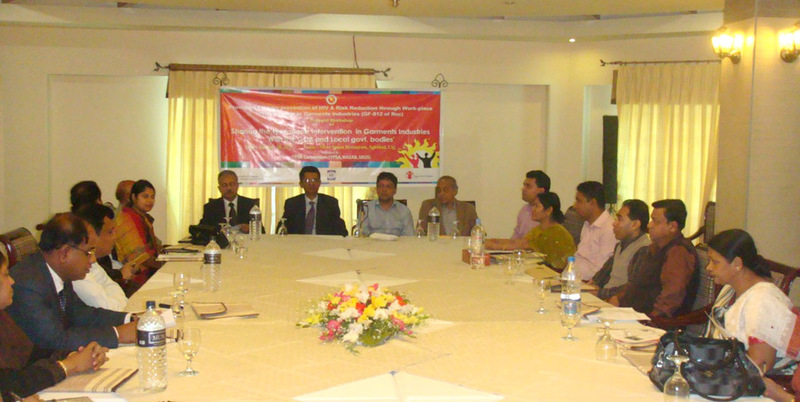 Head of Department – Dermatology & STDs of Chittagong Medical College has chaired this Workshop. Mr. Nasir Uddin Chowdhury – BGMEA Ist Vice-President, Mr. M.M Ershad – DD, Family Planning, Chittagong, Mr. Saleh Ahmed Chowdhury – Pannel Mayor, Chittagong City Corporation, Advocate Rehana Begum Ranu – Ward Counselor, Chittagong City Corporation, Dr.Kazi Belayet Ali – Deputy Director, Save the Children USA, Mr. Omar Faruk – Manager Capacity Building, Save The Children USA, Md. Arifur Rahman – YPSA consortium Chair Person & Chief Executive, YPSA, Mr. Mahabubur Rahman – Director(Field Operation), YPSA, Ms. Khaleda Begum – Team Leader, YPSA Consortium, Mr. Akbar Reza – Program & Technical Specialist, YPSA Consortium & GFATM 912 staff were present at the Workshop. This Workshop conducted by Farhana Idrish, YPSA. Project presentation on Global Fund activities, Situation of World HIV/AIDS has presented by Mr. Omar Faruk – Manager Capacity Building, Save The Children USA & Khaleda Begum – Team Leader, YPSA Consortium has presented project presentation on YPSA consortium activities. Mr. Akbar Reza – Program & Technical Specialist, YPSA Consortium & GFATM 912 has facilitated open discussion session.